We’ve been analyzing spaces as part of a class I’m taking (qualitative research methods), and we’ve been examining how a space fits into one of the three spheres described by Habermas. Habermas talked about the economic sphere, the public sphere, and the private sphere. For example, a Wal-Mart clearly lies in the economic sphere – it’s a place where you consume, and that message is clear from the minute you walk into the store, with prices displayed prominently and the resounding beeps that Wal-Mart registers make. Habermas contested that the economic sphere is gradually encroaching on spaces that were previously meant to be public spaces. This example was laid bare when we examined the lobby of the new DeVos Children’s Hospital in Grand Rapids, Michigan. 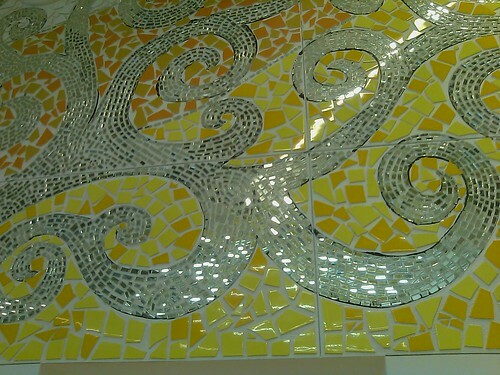 Above is a Flickr album showing the construction of the mosaic in the lobby, as well as the prominently featured gift shop. The DeVos family (of West Michigan Amway wealth) clearly put a lot of money into the design of this hospital. Immediately, the lobby communicates the tremendous wealth behind the hospital, with chairs that don’t look like the furniture of the average American home, and a water-wall behind the check-in station. Are you checking in at the Hyatt Regency, or the hospital? It’s meant to feel more like a hotel than a hospital. The second thing that strikes me is the terrible irony that is presented to anyone who brings a sick child to this hospital. The space is meant to be playful – it looks like the bedroom you would want for your six-year-old son. But I think it might contrast terribly with the emotions I would feel as a parent if I were to bring my child to this hospital. While apparent that a great deal of effort went into building the interior, it seems to conflict with my emotions. In our discussion, it was suggested that this well-designed, orderly, playful space seems to suggest to a parent that you should feel confident in bringing your child here for care. But to me, such places ooze a “false confidence,” the mirage of great service, a clean and slick building that may or may not have great care behind it. When push comes to shove, economically speaking – when doctors and nurses demand higher pay and better patient care – what will happen to this lobby space? How will the hospital spend dwindling resources – on excellent patient care, or maintaining appearances? If there isn’t enough money to maintain the interior, to keep it sharp after it gets used and worn-in, what will happen? Will they cut doctors’ pay to keep the exterior looking nice? To me, a hospital matters for a couple of things. Are the health care providers competent? Is the facility safe and clean? To me, after that, everything else is a frill. The DeVos Children’s Hospital is a clear example of the economic sphere encroaching upon the public sphere. When the economic sphere encroaches too far, resources meant for health care get diverted into other frills that are good for business. And that’s where this building shows an interesting parallel to the healthcare debate. It begs the question of “how do we spend our money in health care?” What is necessary in a hospital? It outlines the debate between the billionaires who would like to run the country the way they see fit, or the government who has a larger cross-section of the population to speak for. In the hospitals run by the billionaires, the appearances matter. Care matters too, but not necessarily on an individual level. What matters is that the doctors have the highest rankings and do the most modern medical procedures (even if they have no evidence to back them up). So, I’m drawn to this parallel. If you’ve ever read Consumer Reports, they always point out the generic product that works better than the name brand product, but costs 40% less than the name brand product. The DeVos Children’s Hospital looks like that name-brand product to me. It may be a great hospital, but it is part of the reason health care costs are spiraling out of control. Where your child is born is like a status symbol, like a BMW in the driveway. The hospital that does your bypass surgery somehow speaks to your status. The cost of keeping up appearances, of trying to lure the best doctors and nurses, the drive to provide medical procedures that don’t always have solid evidence-base behind them, that is a huge part of what makes health care unaffordable. It is amazing what a space can communicate!